Step Inside Jimi Hendrix's Swinging Mayfair Pad! Win an invite to an exclusive soiree in the guitar genius’s restored London apartment. 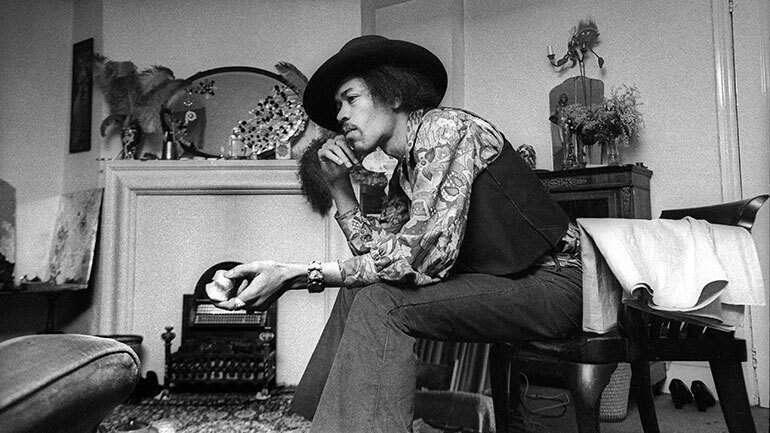 CONNOISSEURS OF JIMI HENDRIX and his Swinging London milieu will be cast into a timewarp as the flat that the guitar god occupied at 23 Brook Street in London’s Mayfair is opened to the public from February 10. Restored to its 1969 finery, the apartment will host a permanent Hendrix exhibition, including the Epiphone FT79 acoustic guitar on which he wrote many of his key songs for the Electric Ladyland album. Found by girlfriend Kathy Etchingham in the classified ads of one of the London evening papers, the flat became theirs for rent of £30 a week. The couple chose curtains and carpets in John Lewis, bought LPs at One-Stop Records in South Molton Street and picked up bits and pieces at second hand shops. And four lucky MOJO readers and their guests will follow in Hendrix’s footsteps on Wednesday February 10, since we have 4 PAIRS of tickets to give away to an exclusive preview evening. Just email your contact details (including best daytime phone number) to mail@handelhendrix.org to enter the draw. Closing date for entries is January 31. The street already had a significant musical association before Hendrix’s occupation, having been home to George Frideric Handel, the great 18th Century composer celebrated in another important restoration at Number 25. Both Hendrix and Handel sites are managed by the same Lottery-funded project, Handel & Hendrix in London.